Detailed times are posted on the Tuesday before game day as every week impacts rankings and who you play on the next Jamboree. Practices run every Tuesday and Thursday from 6pm to 8pm. Players should be wearing cleats and bring water to practice. There is still some room left in our Spring Break camp which runs in the mornings on the first week of Spring Break. This is a great program to get your little players skills warmed up, or introduce new players to the sport. Open to ages 8 to 13. 9:00AM until Noon. This is a non-contact program which will focus on Spring Flag Football skills and athletics. Mercer Stadium, New Westminster - Turf; 9:00AM to Noon. If it says WAITLIST - Put Your Name on the List and Ask your Guardian to Coach! We hope to have 3 teams (30 players) per division, but we are short coaches and therefore managing the players joining. Register soon - as we always will fill the teams fast. 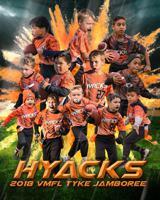 Hyacks Tyke team finished the season strong with 3 wins 0 loss and a draw at this year's VMFL Jamboree. Heavy rainfall was not enough to stop kids have fun and enjoy the event. Thank you to South Delta Rams for hosting this event and to Vancouver Mainland Football League (VMFL) for another successful season! 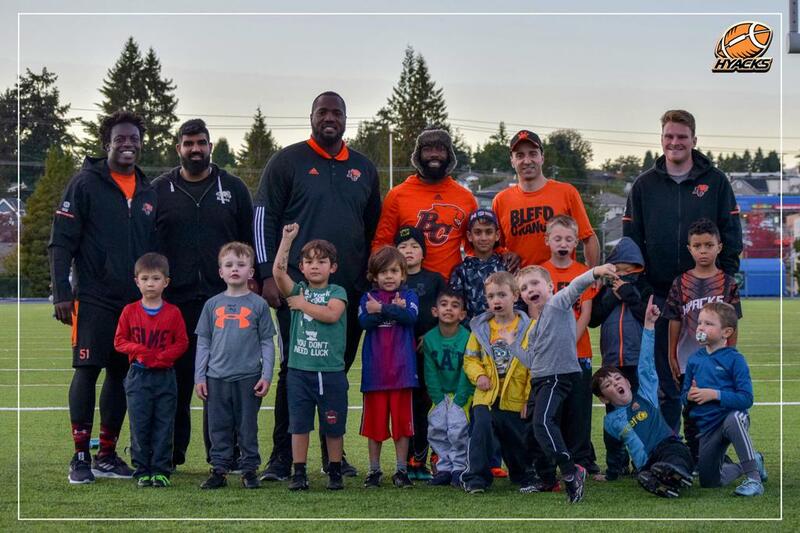 Thank you to Chris Rainey, Ty Long, Micah Awe and Jovan Olafioye of BC Lions for visiting and teaching our kids at Hyacks Football. Hyacks hosted all day the Labour Day opening games to mark the start of VMFL Fall season. All divisions played well and looked so happy to be back on the field. 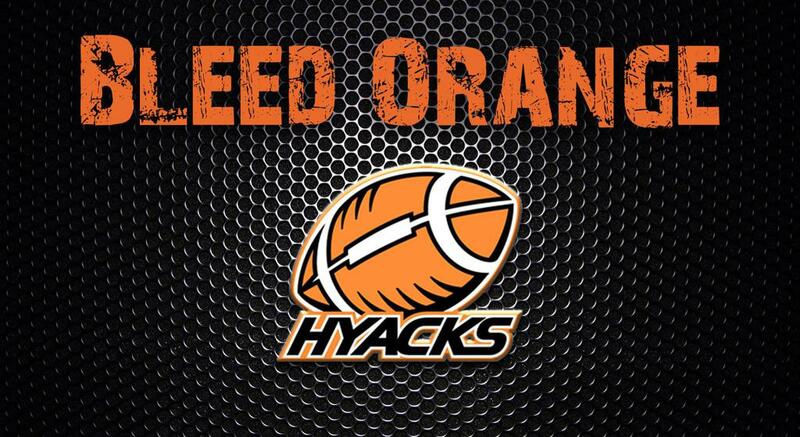 Good luck to all Hyacks teams this season! Hyacks Atom teams Black and Orange took home 3rd and 4th place. Hyacks Tyke and PeeWee played hard under the rain! Hyacks JB secured the Axe! In an intense close game Hyacks JB made the run and win the Axe! Congratulation to the coaches and players for a job well done! Anybody can play football, #WannaPlay? join us! Visit the Hyacks Football Apparel Store and grab yours now! We got Hoodies, Tees, Caps and more! Thank you to all that came out and enjoyed the day with us making the fundraising event for KidSport BC a huge success! To New Westminster Hyacks Football for making it a fun way for kids to learn football. To our volunteers who made sure everything is running smooth. To Subway for providing healthy and delicious lunch. Lastly big thank you to Travis Lulay and Cody Husband for coaching and being good role models to our kids. See you again next year! The Royal City Hyacks Football Club gratefully acknowledges the practical and financial support of both the City of New Westminster and the Province of British Columbia. ©2019 Royal City Hyacks Football Club / SportsEngine. All Rights Reserved.